I dropped by the Studio after work today, bringing some reference sketches with me that I made over the past few days. First thing I noticed was that we're up to 4 dormers on the building. And today was my first ever trip up to the 3rd floor. (I was with Herb on an errand) It was pretty much a wreck, probably how the whole building looked before the restoration began. Still, it was interesting to see how the architecture was different on this floor. But mostly I was there to work. 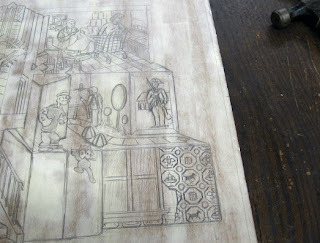 I started with the lower right corner, finishing the last two empty spaces with colonial inspired images. There was a lot of colonial decoration around when I was growing up. Always big in the east, especially New Jersey (Washington spent more time in Jersey during the Revolution than any other single state), it was undergoing another wave of revival in the early 70's. Maybe it was because of the upcoming Bicentennial, or maybe it was a bit of nostalgia against the Vietnam era. All I know is that we always had a lot of it around. The lower corner of the tower shows a window/wall in the room that had been the nursery. My crib was parked under it, and I'm told that I would pull myself up to look out the window. But I also managed to tear away some of the wallpaper next to the window, perhaps my first artwork. This was all before my memory process started, but when I got older I could see the damage. (the crib was moved to another location when my brother came along) Later we would paint over it and turn it into a TV room, but the family photo album records the original paper, shown here, with such bits of colonial/americana as a sailing ship, horse, drum, and eagle. Above the wallpaper is an image of a continental soldier. We had lots of such things around the house, including some framed images of colonial era soldiers in a professionally illustrated style that hung around our various homes. But the one that made the biggest impression on me was one hanging in my bedroom upstairs in that same house. Less formal and more folk art, this one had a soldier standing in front of a building. I remember staring at this thing from my bed, so maybe the first artwork to make an impression on me. 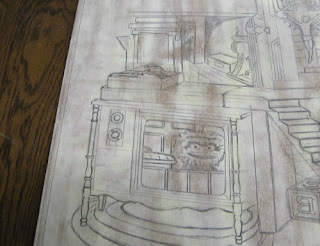 The actual piece is long gone, probably in a garage sale, so what I've drawn here is my best memory of it. I also resolved a few areas on the other side of the block. I put an image on the tv in the lower left corner, a reference to the show I watched religiously starting when it first went on the air when I was about 2. In the final print, this will be colored as a black and white image. Above that I added a few hand tools to the scene of crude wood construction. This is a tribute to the many things I built as a kid. Some of my favorite toys in my pre-school years were hammers, saws, drills, scrap wood, etc. No power tools, but otherwise I was left to have my fun in the back yard. My skills in this area have improved considerably since then, as evidenced by all the furniture you see in various Studio views. This pretty much finishes the two lower levels of the tower, though I will eventually have to do something with the ground around the base.